The M18 SAWZALL Reciprocating Saw delivers unmatched durability, speed, and run-time. The all metal gearing and REDLINK Intelligence provide ultimate performance and protection against jobsite conditions. The M18 SAWZALL Reciprocating Saw provides up to 30% faster cutting and 50% more run-time in key applications versus leading competitors. The slim front end design provides improved ergonomics, offering maximum comfort and control. The REDLITHIUM Battery Pack delivers more work per charge and more work over pack life than the competitors. The M12 Cordless Heated Hoodie from Milwaukee Tool provides up to 6 hours of continuous heat in a rugged jobsite design. This soft but durable cotton blend hoodie provides ample warmth for spring and fall or serves as an extra-warm liner on the harshest winter days. State-of-the-art carbon fibre heating elements provide adjustable warmth to the core body area, while a waffle-weave thermal liner and rib knit cuffs keep the heat in. Best of all, the hoodie is machine washable and dryer safe. Powered by the durable M12 REDLITHIUM Battery, the Cordless Heated Hoodie gives you up to 6 hours of continuous fade-free heat, even in extreme weather conditions. 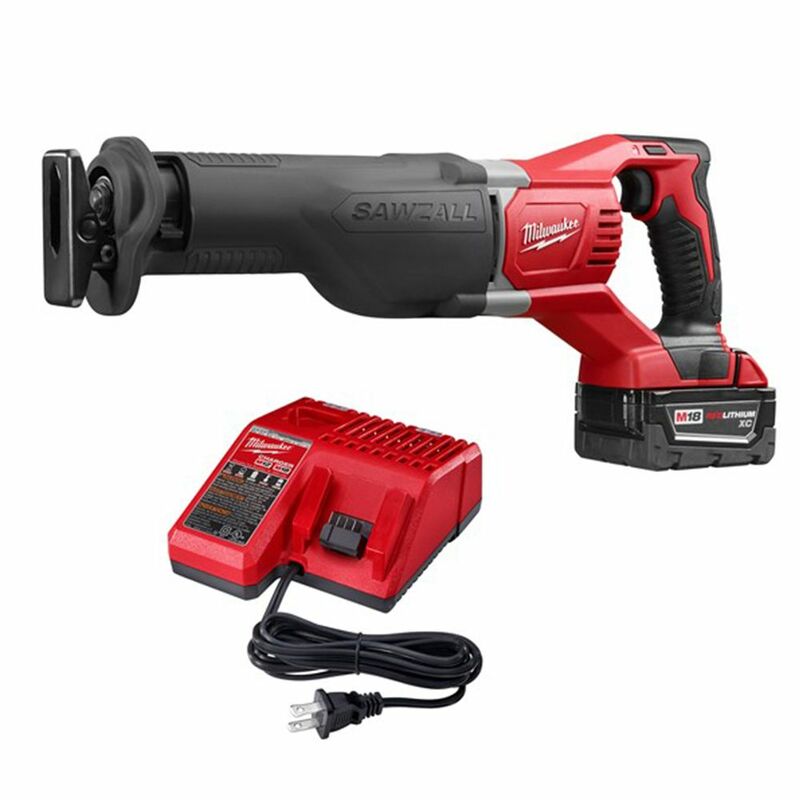 The battery and charger are compatible with more than 55 M12 LITHIUM-ION tools. This hoodie is also available in gray, khaki or high-visibility lime, in sizes S-3XL. Powered by M12 REDLITHIUM Battery Technology, Milwaukee<sup></sup> M12 Heated Hoodies use carbon fibre heating elements to create and distribute heat to the chest and back. Combining a durable cotton/polyester exterior with a waffle weave thermal lining, the hoodie provides a versatile three-season solution to keep heat in and allow users to shed bulky layers. The Milwaukee M18 Cordless lithium-ion HACKZALL 1-Handed Reciprocating Saw features a patent-pending, dual-gear, anti-vibration system for unmatched comfort and control. The saw's lightweight design gives you superior control and versatility for true 1-handed operation, even overhead. The powerful motor delivers 0-3000 strokes per minute. A 3/4 in. stroke length allows for fast cutting through a wide range of materials such as wood, metal and PVC. Works with SAWZALL and HACKZALL blades. Special Buy M18 XC5.0 Kit W/ SAWZALL Reciprocating Saw The M18 SAWZALL Reciprocating Saw delivers unmatched durability, speed, and run-time. The all metal gearing and REDLINK Intelligence provide ultimate performance and protection against jobsite conditions. The M18 SAWZALL Reciprocating Saw provides up to 30% faster cutting and 50% more run-time in key applications versus leading competitors. The slim front end design provides improved ergonomics, offering maximum comfort and control. The REDLITHIUM Battery Pack delivers more work per charge and more work over pack life than the competitors. Special Buy M18 XC5.0 Kit W/ SAWZALL Reciprocating Saw is rated 5.0 out of 5 by 1. Rated 5 out of 5 by Woodman from Great saw My old saw stopped working and I bought this one, it is a great especially when it comes with the 5.0 battery. I finished my deck. Very happy with price also. I love using Milwaukee tools.